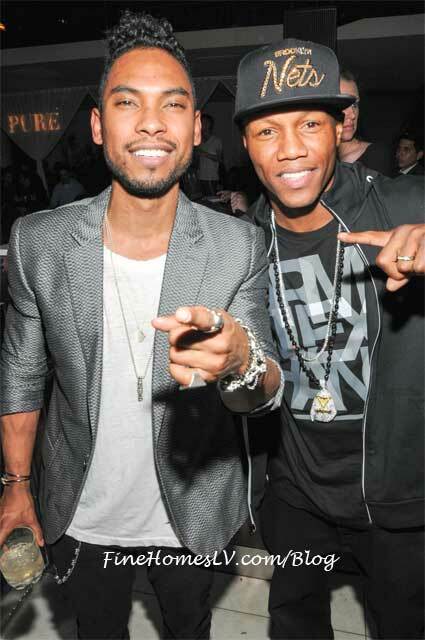 GRAMMY Award-winner Miguel took over PURE Nightclub by Angel Management Group inside Caesars Palace Las Vegas and gave clubgoers a memorable performance last night. Around 1 a.m. the R&B singer, accompanied by his stunning girlfriend Nazanin Mandi, hit the red carpet and posed for photographers. Dressed to the nines, Miguel sported a fashionable tailored gray blazer, white tee-shirt and black fitted jeans while his sweetheart dawned a flattering yellow two-piece dress with black heels. Making their way into the mega-club the duo joined their entourage at their VIP table located on the main stage. Taking in the energy from the packed room, a humbled Miguel hopped on top of his plush booth and raised his glass to toast his admirers. Just after 2 a.m. the soulful artist took over the mic and addressed the crowd. “If you’re having a good time right now say yeah,” he said and the energy of the nightspot soared. 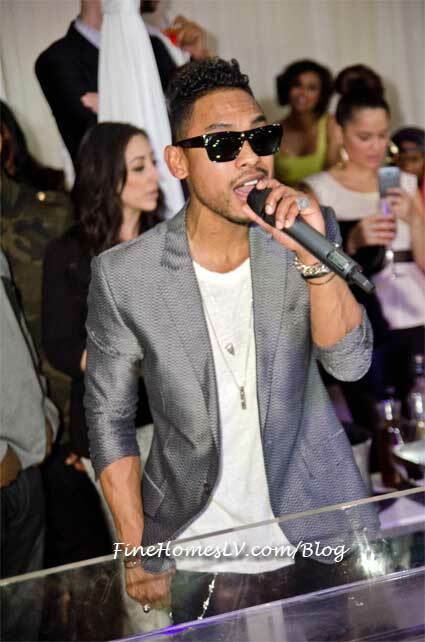 Kicking off his performance, Miguel began his hit “Sure Thing” and had his admiring fans singing along. As he segued into his fan favorite “Quickie” the singing heartthrob made his way around the nightclub and through guests’ VIP booths while serenading a few lucky ladies as he passed. Appearing atop a booth in the middle of the main room, Miguel began his prized single “Adorn” giving his fans a once in a lifetime, up-close experience. As he brought his show-stopping performance to an end, the star showed off his award-winning vocals as he continued the hit a cappella leaving the audience in awe. 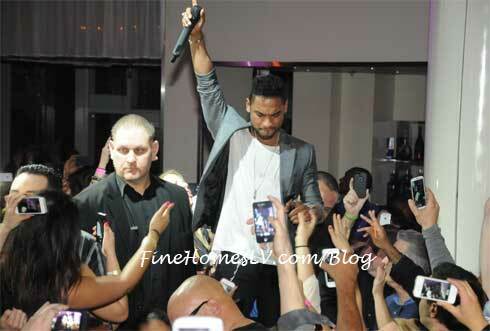 As he made his way back to his table Miguel took the time to greet many of his fans and posed for pictures. The flawless performer spent the rest of the evening dancing and cuddling with his lady, sipping cocktails and mingling with fans. 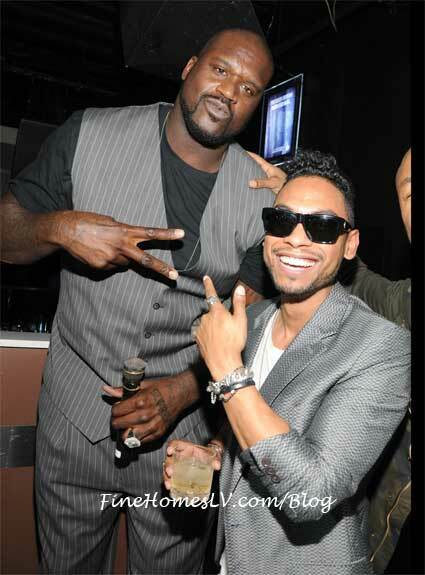 Just before Miguel took the stage, the hot spot was taken over by the legendary NBA star Shaquille O’Neal as he hopped on the mic and had resident DJ Shift play a number of top hits as he showed off his best dance moves and had the audience singing along. It was a star-studded affair last night as World Welterweight Champion boxer Zabdiel “Zab” Judah was seated a few tables down from Miguel.